Almost 50% of the companies in the world use Aptitude tests as a part of their recruitment procedure. 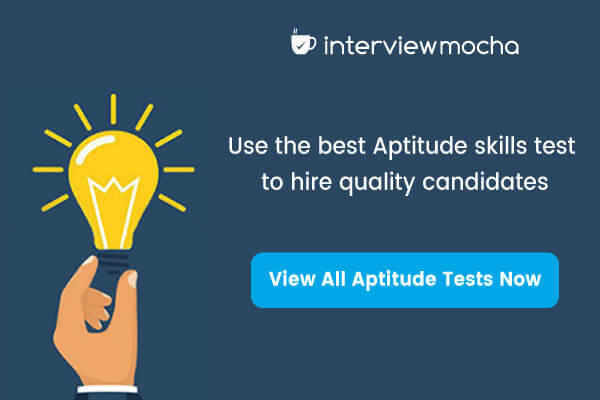 Aptitude tests are often used as a method of screening to identify high caliber candidates. However, the content of the Aptitude tests must be such that it makes the test fun and interesting for the candidate and at the same time gives an accurate picture of their ability. Interview Mocha has focused on enriching the content part which allows its customers to effectively screen quality candidates in minimum time. English Proficiency and Verbal skills: Our English Proficiency and Verbal skills bank comprises of Grammar, Reading, Comprehension, and Verbal ability all under a single umbrella. Customers can pick and choose the questions to create the perfect test. Analytical Thinking: Created by the best minds in the world, this skill bank puts forth a wide array of questions that evaluate the thinking and reasoning skills of the test taker. Attention to Detail: One of the core aspects of Analytical thinking and Aptitude is a candidate’s attention to details score. Mocha’s question bank contains a series of image-based and situation based question that brings forth this ability of the candidate.